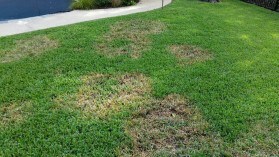 Weedex has created a lawn fungus disease treatment program for St. Augustine lawns. Depending on the climate, this treatment should be done twice a year in the spring and early fall. Using good lawn care practices is the best way to prevent lawn fungus. However, if weather conditions are not favorable, the prevention of the fungus may not be possible. Irrigate grass only when needed. Water early in the morning, this disease can spread fast when moisture is present. Avoid spreading the disease to other areas. Remove clippings if the weather is warm and moist to prevent spread to other areas during mowing. Keep lawns mowed on a regular basis to the proper height. Prevent excessive thatch buildup. Provide good drainage for both surface and subsurface areas. Your satisfaction is guaranteed. Call us for a free, no-hassle estimate on our lawn fungus treatment program: (972) 727-9207. Take All Root Rot: A Lawn fungus disease that begins with yellowish chlorosis that turns brown to straw colored. It may form in circular patches. The turf becomes thin because the roots, nodes, and stolons become infected and die. Topdressing with peat moss along with fungicide treatment can suppress the disease. Grey Leaf Spot: A lawn fungus disease that begins with yellowish chlorosis that turns brown. Numerous oblong gray to ash brown lesions appear on the grass blades. Topdressing with peat moss along with fungicide treatment can halt the disease. 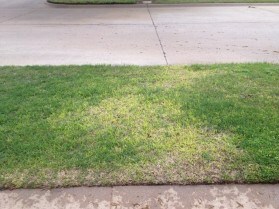 Brown Patch: Lawn disease that has a circular or irregularly shaped patches of light brown, thin grass. These areas range in diameter from a few inches to several feet. Often the center of the patch will recover, resulting in a doughnut-shaped pattern. In most cases, infected areas will not recover during the current growing season. Damaged areas are also slower to green up the following year; usually thirty days behind the rest of the lawn. Like us on Facebook and stay up to date on lawn tips and seasonal specials.